I PURCHASED THESE SANTA FIGURES YEARS AGO – THEY ARE ABSOLUTELY BEAUTIFUL AND I COULDN’T RESIST! THEY WERE HAND-PAINTED BY A VERY TALENTED PAINTER AND ARE CREATIVELY MADE FROM RE-PURPOSED PIECES OF WOOD. 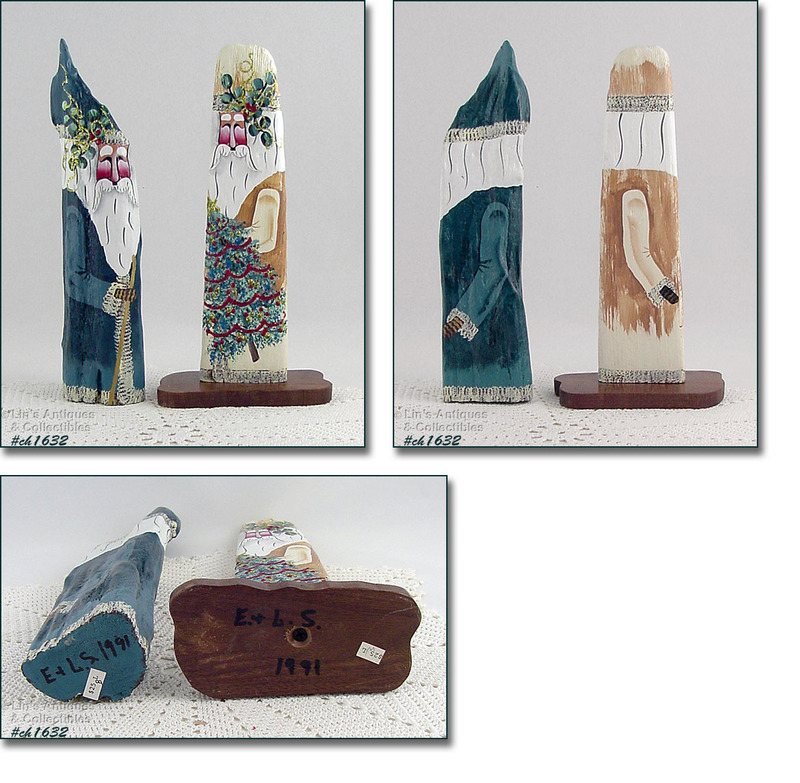 THESE MAY BE RUSSIAN SANTAS – I HAVE BEEN UNABLE TO FIND ANY INFORMATION ABOUT THEM BUT THEY DO HAVE MANY CHARACTERISTICS OF RUSSIAN HAND-PAINTED SANTAS. THE BLUE SANTA APPEARS TO BE DRIFTWOOD WHILE THE WHITE SANTA HAS A GROOVE ON ONE EDGE SO I SURMISE THAT HE WAS ACTUALLY A PIECE OF WOOD FLOORING! BLUE SANTA MEASURES 11 ¼” TALL (AT TALLEST), AND 2 ¾” WIDE (AT WIDEST). HE DOES NOT HAVE AN ATTACHED WOODEN BASE BECAUSE HIS WIDTH MAKES HIM FREE STANDING. WHITE SANTA MEASURES 10 ¾” TALL AND 1/2” WIDE (WHICH IS WHY HE HAS AN ATTACHED WOODEN BASE FOR STABILIZATION). THE BASE MEASURES 5 ½” X 2 ½” X ¼” AND IS A BEAUTIFUL PIECE OF WOOD (LOOKS LIKE PECAN). BOTH PIECES ARE SIGNED AND DATED ON BOTTOMS: E. & L. S. 1991. THE ORIGINAL PRICE TAGS/STICKERS OF $25 ARE ALSO ON THE BOTTOMS. BEAUTIFUL PIECES OF FOLK ART – YOU’LL LOVE THEM! THIS LISTING HAS TWO GORGEOUS AND SOMEWHAT RARE CHRISTMAS LADY HEAD VASES! THEY WERE MADE BY HOLT HOWARD AND ARE DATED 1959. VASES MEASURE 3” TALL AND BOTH LADIES HAVE THE ORIGINAL CHRISTMAS "ORNAMENT" GLASS EARRINGS THAT ARE SO OFTEN MISSING OR BROKEN. BOTH LADIES ALSO WEAR THE ORIGINAL "FAUX" PEARL NECKLACES. BOTH VASES ARE IN SUPER CONDITION WITH NO CHIPS OR CRACKS. THIS LISTING HAS A BEAUTIFUL LEFTON BELL! IT HAS NATIVITY SCENE ALL AROUND AND THE INSIDE HAS GEO. LEFTON WITH COPYRIGHT DATE OF 1982. EXCELLENT CONDITION! COORDINATES BEAUTIFULLY WITH OUR LEFTON CANDLEHOLDERS (INVENTORY #CH775)). ABSOLUTELY BEAUTIFUL NATIVITY SET WITH THE ORIGINAL BOX! ALTHOUGH BOX SHOWS STORAGE EVIDENCE, NATIVITY PIECES ARE IN MINT CONDITION WITH AMAZING COLOR AND DETAIL – PIECES ARE NICE, LARGE SIZE TOO! 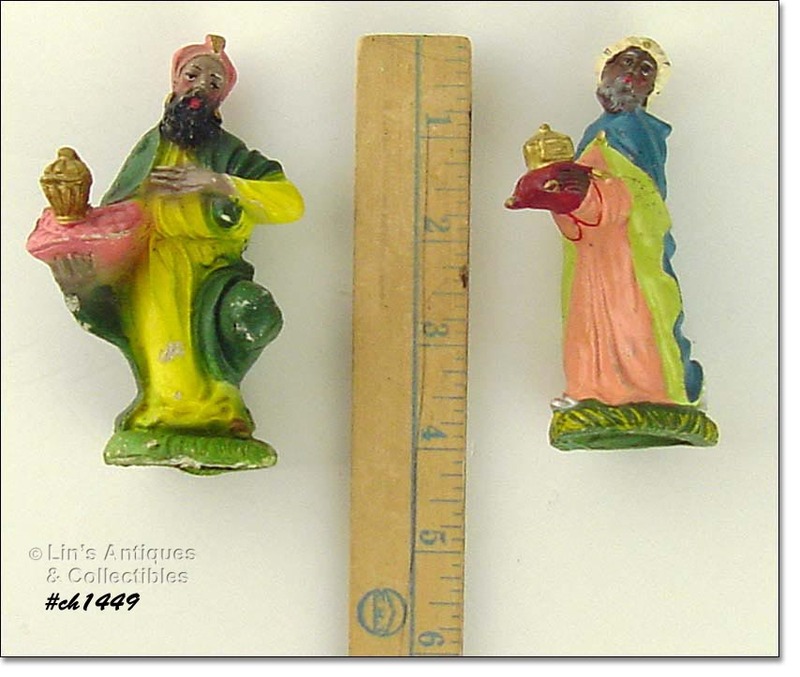 WISE MEN MEASURE 9 ¾”, 9 ¼”, AND 7 ½” TALL. THERE IS ONE SHEPHERD, 7 ½” TALL (8” TALL INCLUDING LAMB ON HIS SHOULDERS). ONE SHEEP IS 3 ¾” LONG (AT LONGEST) 2 3/8” TALL (AT TALLEST), THE OTHER ONE IS 3 ¼” LONG (AT LONGEST) AND 2 ¼” TALL (AT TALLEST). DONKEY IS 5 ½” LONG, 3 ¾” TALL. COW IS 5 ¾” LONG, 2 ¾” TALL. MARY IS 6 5/8” TALL, JOSEPH IS 7” TALL. BABY JESUS AND MANGER ARE ONE PIECE THAT MEASURES 4 5/8” LONG (AT LONGEST), 3 5/8” WIDE (AT WIDEST), AND 2 ¾” TALL (AT TALLEST). THE ANGEL IS 5 ¾” LONG (AT LONGEST), AND 3 1/8” WIDE (AT WIDEST). ALL PIECES ARE STAMPED MADE IN JAPAN. THEY ARE MADE TO RESEMBLE CARVED WOOD BUT I BELIEVE THEY ARE PAPIER-MÂCHÉ. THE STABLE IS 11 ½” TALL (AT TALLEST) AND THE BASE MEASURES 17 ¾” X 8”. ABSOLUTELY BEAUTIFUL, HEIRLOOM QUALITY NATIVITY SET! THIS LISTING HAS EXCEPTIONAL NATIVITY PIECES – THE HOLY FAMILY! 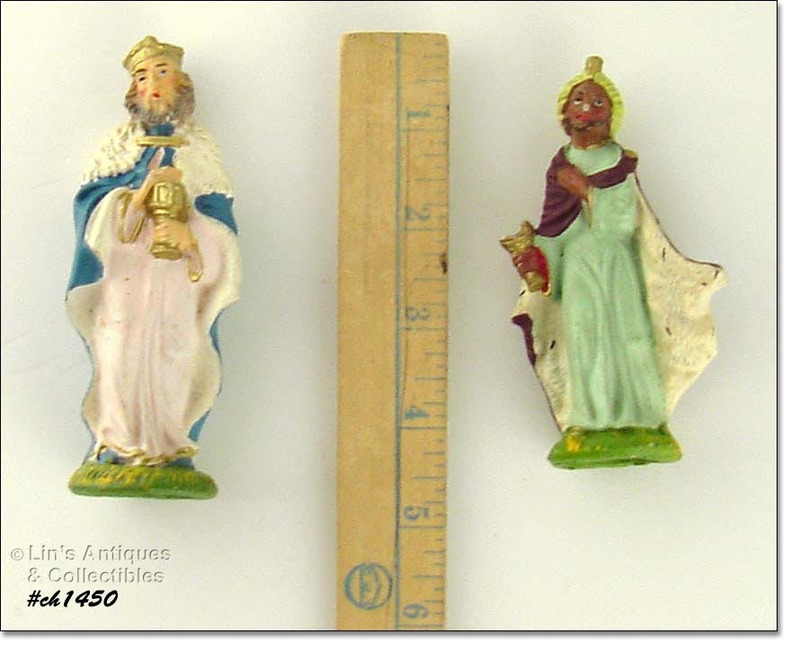 JOSEPH AND MARY EACH MEASURE 6 ¼” TALL (AT TALLEST), BABY JESUS MEASURES 4” LONG. THE MANGER IS 5” LONG AND 3 ½” WIDE (AT WIDEST). ALL PIECES ARE IN WONDERFUL CONDITION (JOSEPH HAS LOST HIS STAFF – THAT’S IT!). I PURCHASED THESE AT AN ESTATE SALE AND WHILE THEY ARE NOT ESPECIALLY DIRTY, THEY COULD USE A CLEANING WITH A COTTON SWAB TO FULLY APPRECIATE THEIR BEAUTY. VERY NICE! 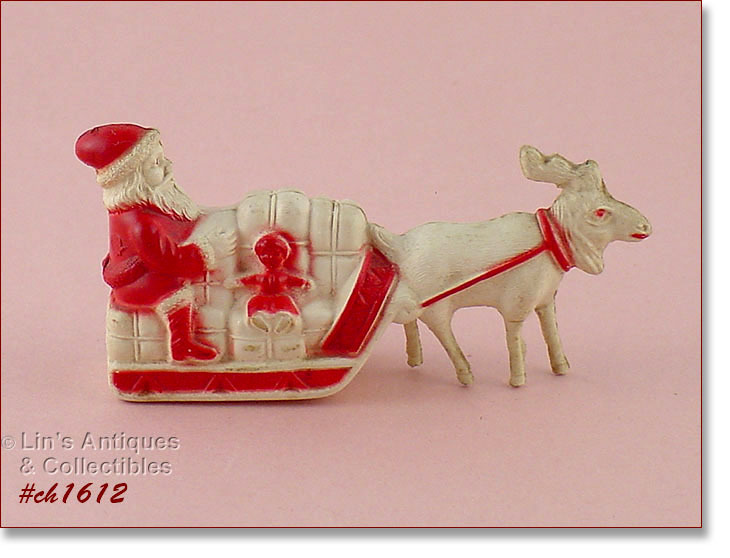 THIS LISTING HAS A VINTAGE SANTA IN SLEIGH WITH TWO REINDEER! REINDEER ARE CELLULOID, SANTA MAY ALSO BE CELLULOID (COULDN’T’ BE CERTAIN BECAUSE HE’S GLUED TO THE SLEIGH), AND THE SLEIGH IS CARDBOARD/PASTEBOARD. ITEM IS IN SUPER CONDITION – COULD USE A LIGHT CLEANING BUT I DON’T KNOW HOW TO GO ABOUT IT WITHOUT CAUSING DAMAGE, SO PERHAPS WOULD JUST BE BETTER TO ENJOY AS IS – AFTER ALL, IT’S BEEN AROUND A LONG TIME. 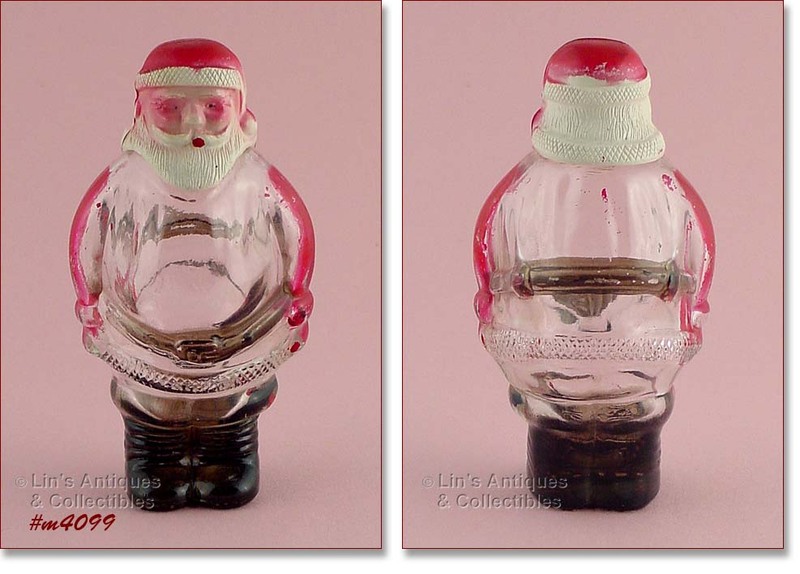 THIS LISTING HAS A REALLY CUTE VINTAGE TINY SANTA IN A SLEIGH WITH AN ATTACHED REINDEER! MEASURES 3 ¾” LONG (AT LONGEST), 1 ¾” TALL (AT TALLEST), AND 1” WIDE (AT WIDEST). NEAT! I’VE HAD THESE PRETTY DECORATIVE CANDLES FOR A NUMBER OF YEARS! THEY ARE DECORATIVE ONLY. I THINK THEY’RE MADE OF LUCITE, ARE A RED/ORANGE COLOR WITH GLITTER FLECKS AND MEASURE 8” TALL. VERY PRETTY! 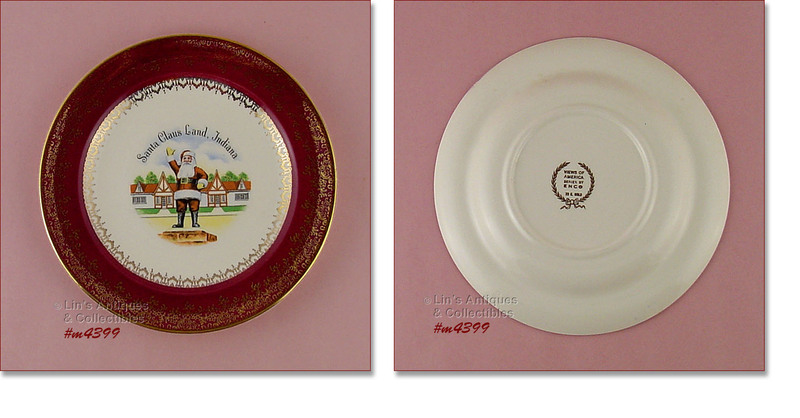 THIS LISTING HAS AN EXCELLENT CONDITION SOUVENIR COLLECTOR PLATE FROM SANTA CLAUS LAND, INDIANA! MEASURES 7 ¼” DIAMETER AND BACK HAS “VIEWS OF AMERICA SERIES BY ENCO, 22 KT. GOLD”. NEAT! THIS LISTING HAS A MINIATURE SOUVENIR TEA SET FROM SANTA CLAUS LAND, INDIANA! IT IS NOT A COMPLETE SET – IT IS MISSING ONE PLATE. SET HAS TEA POT WITH LID, COVERED SUGAR, CREAMER, 4 CUPS AND 3 PLATES. THE TEAPOT AND 3 PLATES HAVE THE SANTA DECAL, THE OTHER PIECES JUST HAVE “SANTA CLAUS LAND” DECALS. TEAPOT MEASURES 2 ¼” TALL (AT TALLEST), SUGAR IS 1 5/8” TALL (AT TALLEST), CREAMER IS 1” TALL, CUPS ARE 1” TALL, AND PLATES MEASURE 1 ¾” DIAMETER. IN WONDERFUL CONDITION, SPOUT OF TEAPOT HAS A VERY TEENY DING – THAT’S IT! CUTE COLLECTIBLES! 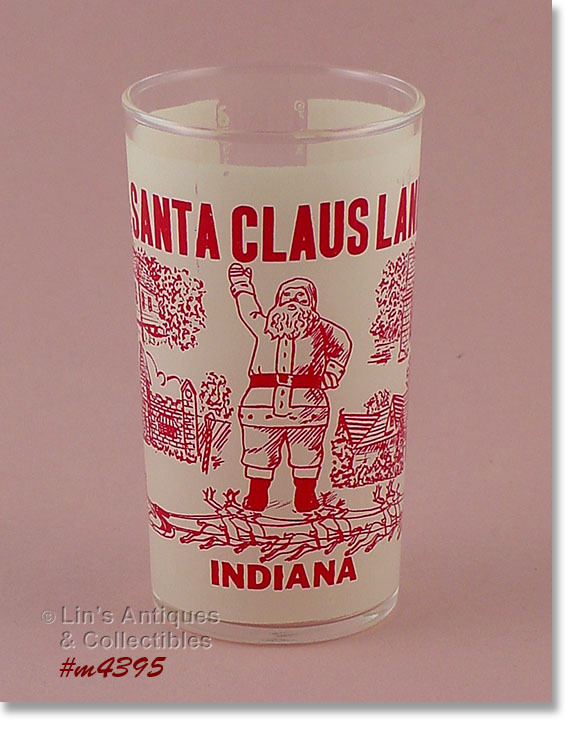 THIS LISTING HAS A SANTA CLAUS LAND, INDIANA SOUVENIR GLASS! MEASURES 4 ¾” TALL AND WAS MADE BY FEDERAL GLASS COMPANY. GLASS IS IN VERY GOOD CONDITION – HAS A SMALL AREA OF MISSING WHITE COLOR ABOVE THE WORD “LAND”. NEAT COLLECTIBLE! 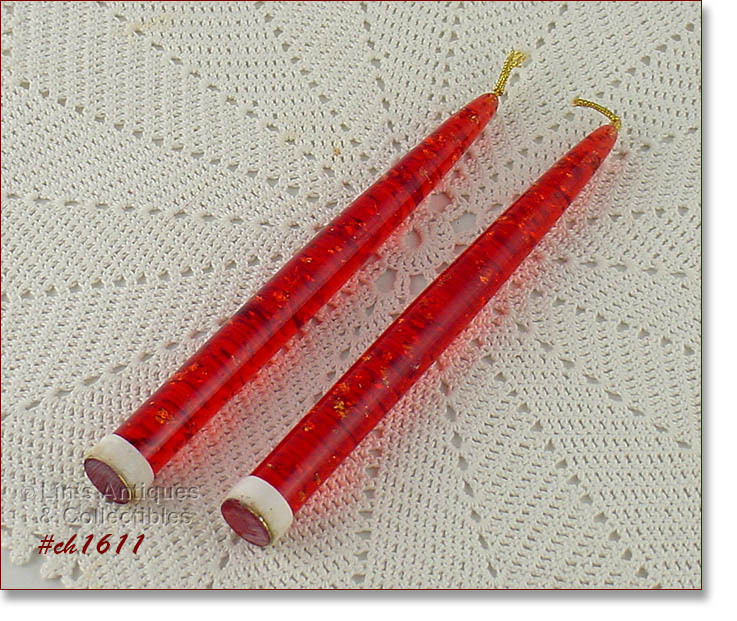 THESE VINTAGE GLASS “CANDLES” ARE GETTING MORE AND MORE DIFFICULT TO FIND! THIS LISTING HAS A SET OF 4, MEASURING APPROXIMATELY 10” TALL. NEAT ITEMS! 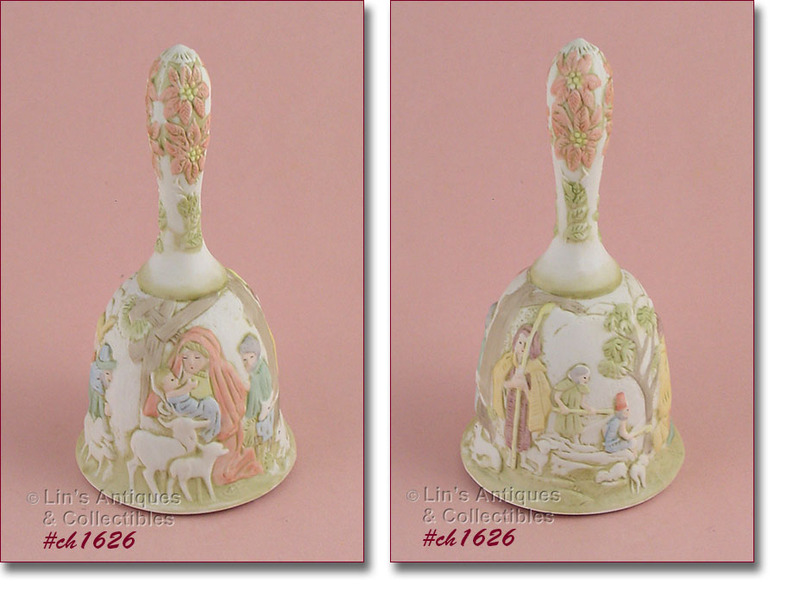 REALLY CUTE LITTLE LEFTON BELL THAT HAS BEEN PART OF MY HOLIDAY COLLECTION FOR SEVERAL YEARS! BELL MEASURES 3 ½” TALL (AT TALLEST), HAS THE RED AND GOLD LEFTON STICKER/LABEL, AND THE NUMBERS 1205 (ON INSIDE OF BELL). IT IS IN EXCELLENT CONDITION – NO CHIPS, CRACKS, DINGS, ETC. – AND CLAPPER IS INTACT! EXCELLENT CONDITION “NOEL” WALLPOCKETS/CANDLEHOLDERS/VASES! MEASURE 4” TALL, ARE FREE-STANDING BUT ALSO HAVE HOLES ON BACK FOR HANGING. THEY ARE IN THE ORIGINAL BOX BUT IT HAS LOST THE TOP FLAP. SUPER ITEM! ANOTHER SET OF ANGEL CANDLE HUGGERS! EXCELLENT CONDITION AND IN THE ORIGINAL BOX (TOP FLAP IS MISSING FROM BOX). SUPER! WOW – WHAT A FIND! THIS IS A LEFTON SLEIGH WITH 2 REINDEER AND THEY ARE IN EXCELLENT CONDITION!! SLEIGH HAS THE RED AND GOLD LEFTON STICKER AS WELL AS THE ORIGINAL SALE TAG OF $3 FROM MARSHALL FIELDS! ONE SLEIGH RUNNER IS ALSO STAMPED GEO. Z. LEFTON AND A DATE THAT IS NOT COMPLETELY LEGIBLE BUT I BELIEVE IT’S 1956. DON’T MISS THIS! 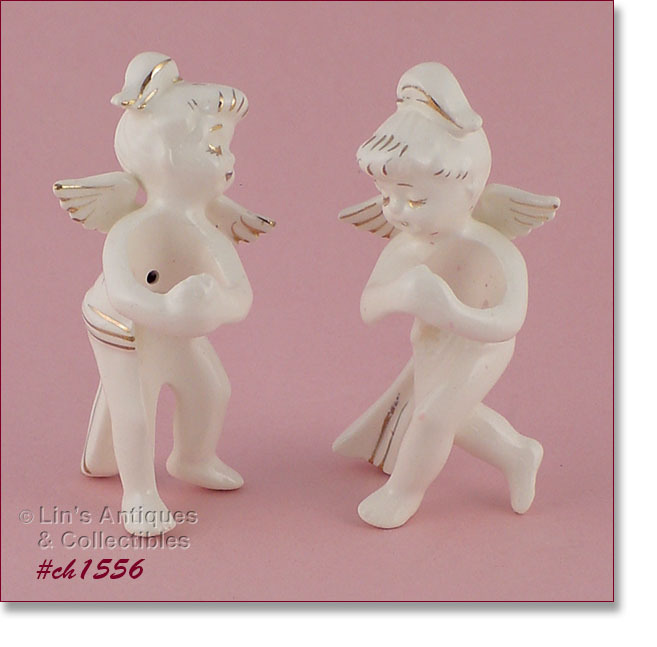 THIS LISTING HAS 3 LEFTON ANGEL BABY FIGURINES! THEY MEASURE 2 ½” TALL, BOTTOMS HAVE THE ORIGINAL RED AND GOLD LEFTON STICKERS, AND THEY ARE IN EXCELLENT CONDITION. ADORABLE! 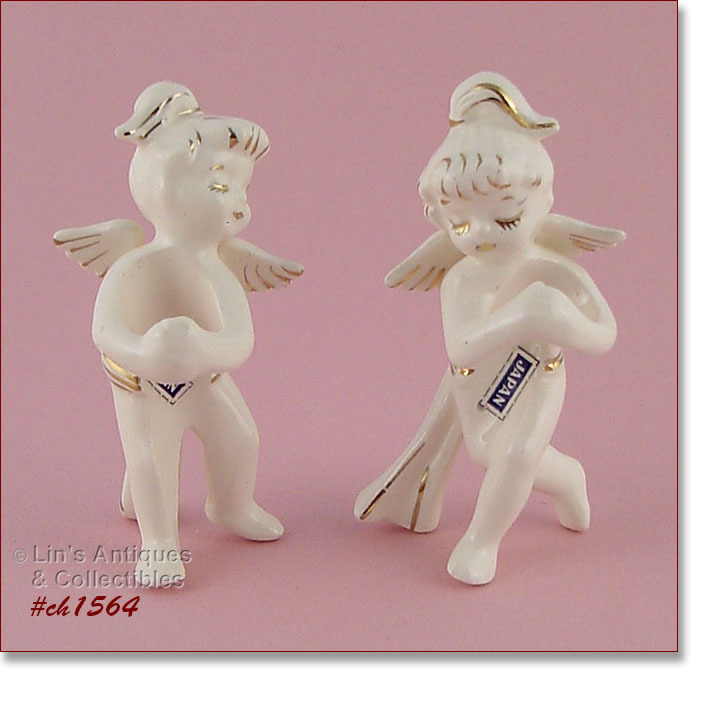 THIS LISTING HAS A PAIR OF ANGEL CANDLE HUGGERS STILL IN THE ORIGINAL BOX! 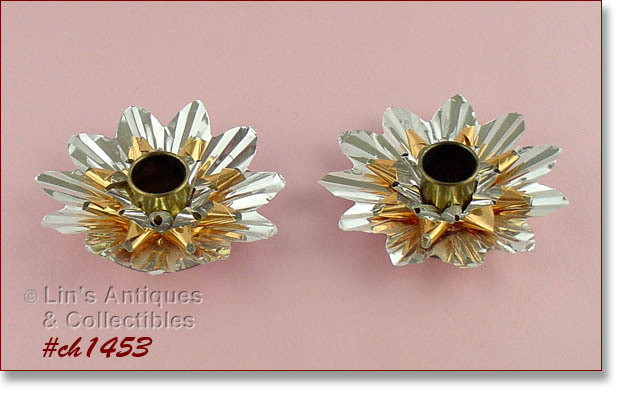 THEY MEASURE 3 ¾” TALL AND ARE IN EXCELLENT CONDITION. THE BOX IS MISSING THE TOP FLAP. THESE COLORFUL DEER HAVE BEEN A PART OF MY VINTAGE CHRISTMAS COLLECTION FOR MANY YEARS! THERE ARE 6 LARGER SIZE (9 ½” TALL AT TALLEST) AND 1 SMALL SIZE (4 ½” TALL AT TALLEST). THEY ARE ALL IN VERY GOOD TO EXCELLENT CONDITION WITH SOME HAVING MINOR STORAGE/USE EVIDENCE – NOTHING SERIOUS. NEAT ITEMS, DIFFICULT TO FIND. THIS LITTLE LADY HAS BEEN DISPLAYED ON MY DRESSER FOR MANY YEARS! BECAUSE OF MY RECENT HEALTH DIAGNOSIS, I AM DOWN-SIZING MY PERSONAL COLLECTION AS WELL AS MY EXISTING ON-LINE INVENTORY. 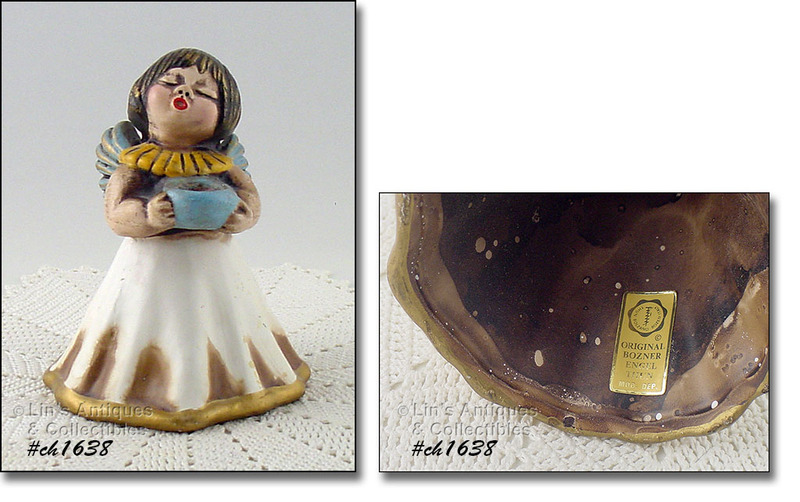 LITTLE LADY PLAYS “SILENT NIGHT”, BOTTOM IS DATED 1973, AND SHE MEASURES 7 ½” TALL (AT TALLEST). YOU’LL LOVE HER! SHE IS IN VERY GOOD CONDITION BUT I NOTICED SHE HAS A SQUARE PLACE ON HER BACK LIKE MASKING TAPE OR GLUE RESIDUE – MAYBE WHEN SHE WAS NEW SHE HAD WINGS BUT SHE DIDN’T WHEN I PURCHASED HER AT AN ESTATE SALE YEARS AGO. THIS LITTLE LIGHT HAS BEEN A PART OF MY VINTAGE HOLIDAY COLLECTION FOR MANY YEARS! IT IS HARD PLASTIC, MADE IN ITALY, AND HAS THE HOLY FAMILY SURROUNDED BY MINI MULTI-COLOR LIGHTS WITH CLEAR PLASTIC STARS. MEASURES 6 ¼” TALL (AT TALLEST) AND 4 ¼” WIDE (AT WIDEST). THE CORD HAS AN ON/OFF SWITCH AND ALL BULBS ARE IN WORKING CONDITION. AS WITH ALL OLDER ELECTRICAL ITEMS, PLEASE USE WITH CAUTION. 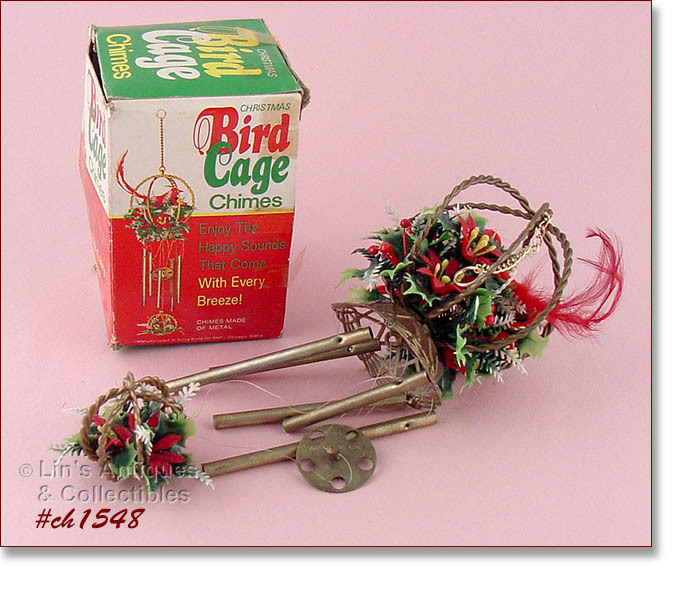 THIS LISTING HAS A REALLY NEAT AND UNUSUAL CHRISTMAS ITEM – BIRD CAGE CHIMES! ITEM IS IN THE ORIGINAL BOX. 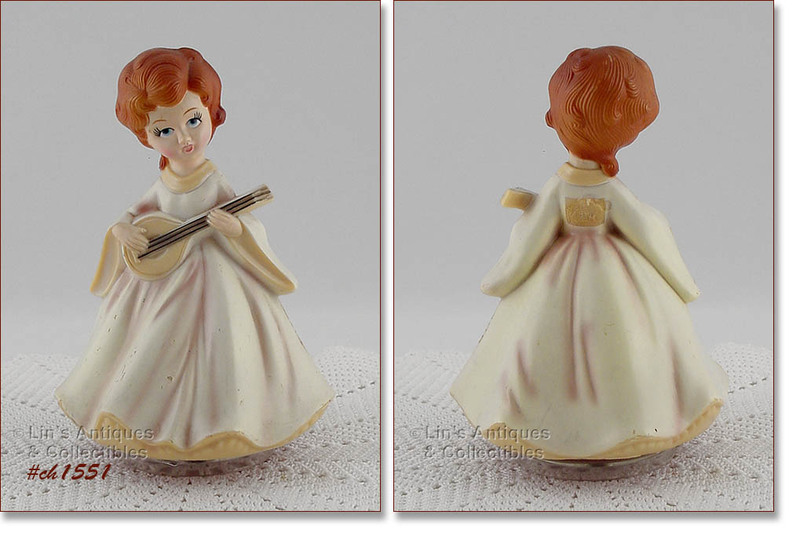 THIS IS AN ADORABLE VINTAGE CHRISTMAS ITEM – IT’S A MUSICAL ANGEL! YOU PULL THE STRING AND IT PLAYS SILENT NIGHT. ANGEL IS GOLD COLOR AND MEASURES 4 1/8” TALL. AN UNUSUAL ITEM! I HAVE 4 AVAILABLE – MINT IN BOX LONGABERGER TIE-ON ACCESSORIES! 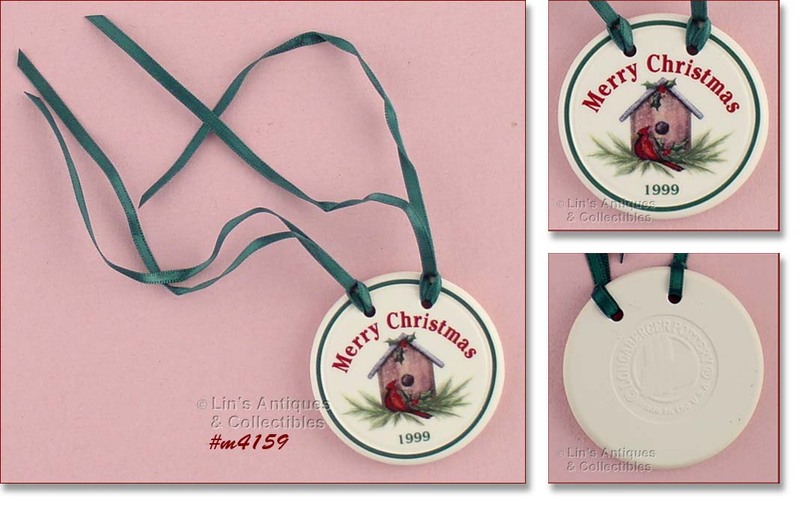 THESE ARE CHRISTMAS 1999, MEASURE 2” DIAMETER – SUPER! THESE LITTLE FIGURINES ARE SO CUTE! THEY ARE LITTLE BOYS AND EACH “HOLDS” A MUSICAL INSTRUMENT. 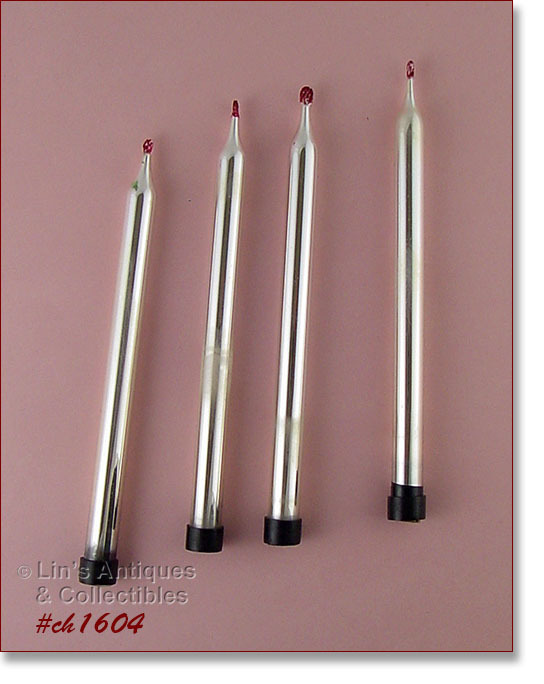 MEASURE 2 ½” TALL AND ARE IN EXCELLENT CONDITION WITH NO CHIPS OR DINGS. THERE ARE NO MANUFACTURER’S MARKINGS, PROBABLY HAD PAPER LABELS/STICKERS. NEAT COLLECTIBLES! THIS IS A NEAT ITEM – A SANTA IN HIS SLEIGH WITH 6 REINDEER! MEASURES 9 ¼” LONG (AT LONGEST), 1 1/8” WIDE (AT WIDEST), AND 2 ¼” TALL (AT TALLEST). IT IS IN WONDERFUL CONDITION WITH SOME MINOR PAINT LOSS – THAT’S IT! THIS IS A SUPER SANTA CANDY CONTAINER! HE HAS SOME MINOR COLOR LOSS TO HIS ARMS AND BOOTS – THIS CONTAINER WAS PRODUCED WITH RED ARMS, BLACK BOOTS AND BELT, AND WHITE “FUR” – IT DID NOT HAVE ALL-OVER COLOR. THE PLASTIC HEAD (LID) IS IN SUPER CONDITION AND CONTAINER STILL HAS THE ORIGINAL PAPER STICKER/LABEL ON BOTTOM! PER LABEL, “SANTA CLAUS”, (LIST OF INGREDIENTS), J.H. MILLSTEIN CO, JEANETTE, PA”. NEAT ITEM! THESE CANDLEHOLDERS ARE SO PRETTY AND THEY ARE DIFFICULT TO FIND ITEMS! IF YOU USE ALUMINUM REFLECTORS ON YOUR CHRISTMAS TREE LIGHTS, YOU MUST HAVE THESE CANDLEHOLDERS TO COMPLEMENT YOUR VINTAGE CHRISTMAS DECORATIONS. SUPER ITEMS! 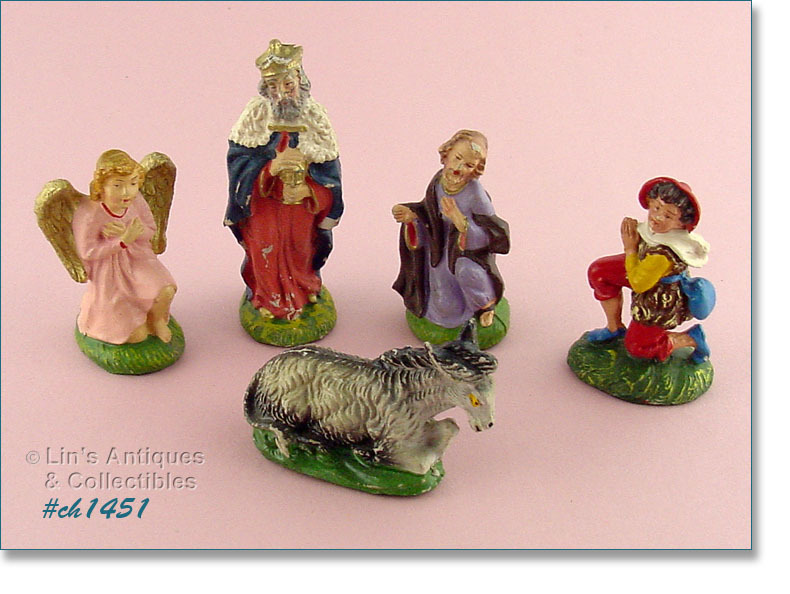 I’VE GROUPED THESE 5 NATIVITY PIECES INTO ONE LISTING! THE ANGEL, SHEPHERD, WISE MAN, AND DONKEY ARE MARKED ITALY. SEE PHOTO TO DETERMINE SIZES. THESE PIECES HAVE SOME “USE” EVIDENCE SUCH AS MISSING PAINT, DINGS, ETC. THE ANGEL IS A DIFFICULT TO FIND NATIVITY PIECE. THIS LISTING HAS TWO NATIVITY PIECES – YOUR CHOICE! SEE PHOTO TO DETERMINE/SEE SIZES. BOTH ARE MARKED ITALY. 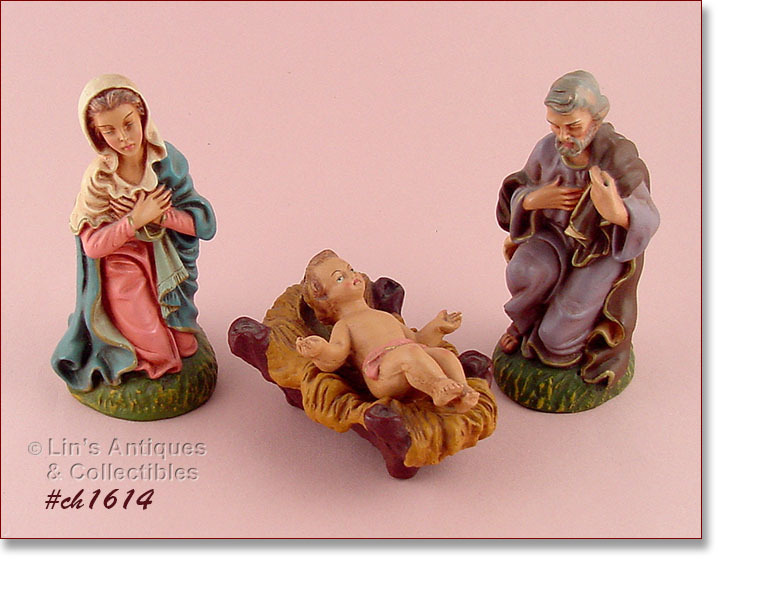 ANOTHER LISTING OF NATIVITY PIECES! SEE PHOTO FOR MEASUREMENTS – TALLER ONE IS MARKED ITALY.